Peter Yarrow and Noel Paul Stookey in concert. 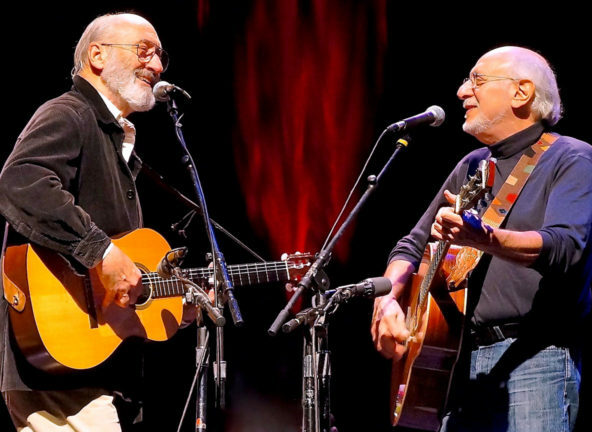 Peter Yarrow and Noel Paul Stookey, best known as “Peter and Paul” of the famous folk trio Peter, Paul and Mary (PP&M), lit up the stage at Pantages Theatre on October 7. As a lifelong fan of the trio, this is the first time I have seen “Peter and Paul” perform together since Mary‘s unfortunate passing in 2009. Any concern that I had that the duo would be incomplete without Mary disappeared soon after these two near-octogenarians took the stage. Their two guitars and still near-perfect vocals made for an incredible and passionate evening of music. Of course that easier to say if your side has won. that I won’t be working on. Always the rebel, Peter Yarrow insisted on taking a knee in protest at the concert – even though pulling it off had the expected level of difficult for a man his age. At a concert about 20 years ago, Peter Yarrow prophesied that when the group reached their 70s, there would be no need for them to do anything more than strum the opening cords to a song and their audience would do the singing. That was definitely true at this concert. Although the duo encouraged the audience to sing along and perform Mary’s part on certain songs such as the group’s only No. 1 song, “Leaving on a Jet Plane”, the reality was that the audience was singing along on virtually every song. The duo continued PP&M’s very special quality: communal music. The participatory nature was emphasized in their first song of the evening, “Weave me the Sunshine”. My five-year-old granddaughter not only sang along loudly, but also proudly confided to me that she was the sunshine in the song. To everyone’s delight, the duo sang their signature song “Puff the Magic Dragon.” As a small child, it was my first PP&M song and it was wonderful to share this precious childhood moment at the concert with my grandchildren. At the concert, the duo reiterated for the umpteenth time that “Puff” was not a drug song, but they noted that they could not vouch for the state of mind of the DJs who played it on the radio. Although the duo did not sing all of my favorite PP & M songs (that would probably take a full day), they sang enough of them to leave a very satisfied audience. After the show and without any fanfare, the duo pleasantly surprised their fans by coming down to the lower level of the Panatages Theatre to meet and talk with their fans. When I introduced Peter Yarrow to my grandchildren as the man who wrote “Puff”, Peter hugged and kissed them creating a very magical memory for both them and me.